It is also important to take losses due to fuel production, transportation, and storage into account. Fuel cell vehicles running on compressed hydrogen may have a power-plant-to-wheel efficiency of 22% if the hydrogen is stored as high-pressure gas, and 17% if it is stored as liquid hydrogen. 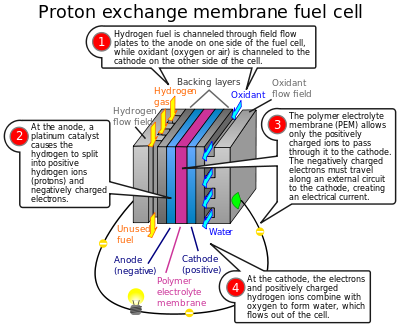 Fuel cells cannot store energy like a battery, except as hydrogen, but in some applications, such as stand-alone power plants based on discontinuous sources such as solar or wind power, they are combined with electrolyzers and storage systems to form an energy storage system. Most hydrogen is used for oil refining, chemicals and fertilizer production and therefore produced by steam methane reforming, which emits carbon dioxide. The overall efficiency (electricity to hydrogen and back to electricity) of such plants (known as round-trip efficiency), using pure hydrogen and pure oxygen can be "from 35 up to 50 percent", depending on gas density and other conditions.. The electrolyzer/fuel cell system can store indefinite quantities of hydrogen, and is therefore suited for long-term storage. In 2015, Toyota introduced its first fuel cell vehicle, the Mirai, at a price of $57,000. Hyundai introduced the limited production Hyundai ix35 FCEV under a lease agreement.. In 2016, Honda started leasing the Honda Clarity Fuel Cell. ^ Prabhu, Rahul R. (13 January 2013). "Stationary Fuel Cells Market size to reach 350,000 Shipments by 2022". Renew India Campaign. Retrieved 2013-01-14. ^ "Roger Billings Biography". International Association for Hydrogen Energy. Retrieved 2011-03-08. ^ "Spotlight on Dr. Roger Billings". Computer Technology Review. Retrieved 2015-09-21. ^ "Fuel Cells - EnergyGroove.net". EnergyGroove.net. Retrieved 2018-02-06. ^ a b "Reliable High Performance Textile Materials". Tex Tech Industries. Retrieved 2018-02-06. 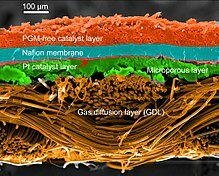 ^ "LEMTA – Our fuel cells". Perso.ensem.inpl-nancy.fr. Archived from the original on 21 June 2009. Retrieved 2009-09-21. 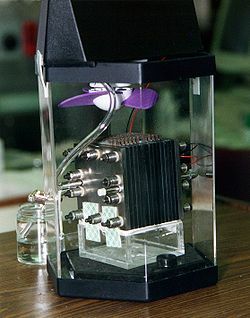 ^ "Ballard Power Systems: Commercially Viable Fuel Cell Stack Technology Ready by 2010". 29 March 2005. Archived from the original on 27 September 2007. Retrieved 2007-05-27. ^ a b Online, Science (2 August 2008). 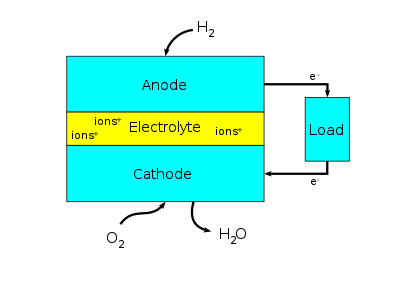 "2008 – Cathodes in fuel cells". Abc.net.au. Retrieved 2009-09-21. ^ Andersson, M.; Beale, S. B.; Espinoza, M.; Wu, Z.; Lehnert, W. (2016-10-15). "A review of cell-scale multiphase flow modeling, including water management, in polymer electrolyte fuel cells". Applied Energy. 180: 757–778. doi:10.1016/j.apenergy.2016.08.010. ^ Haile, Sossina M.; Boysen, Dane A.; Chisholm, Calum R. I.; Merle, Ryan B. (2001-04-19). 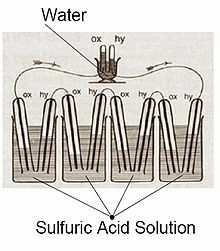 "Solid acids as fuel cell electrolytes". Nature. 410 (6831): 910–913. Bibcode:2001Natur.410..910H. doi:10.1038/35073536. ISSN 0028-0836. PMID 11309611. ^ Haile, Sossina M.; Chisholm, Calum R. I.; Sasaki, Kenji; Boysen, Dane A.; Uda, Tetsuya (2006-12-11). "Solid acid proton conductors: from laboratory curiosities to fuel cell electrolytes". Faraday Discussions. 134: 17–39. Bibcode:2007FaDi..134...17H. doi:10.1039/B604311A. ISSN 1364-5498. ^ "Methane Fuel Cell Subgroup". University of Virginia. 2012. Retrieved 2014-02-13. ^ "Honda FCX Clarity – Fuel cell comparison". Honda. Retrieved 2009-01-02. ^ "Efficiency of Hydrogen PEFC, Diesel-SOFC-Hybrid and Battery Electric Vehicles" (PDF). 15 July 2003. Archived from the original (PDF) on 21 October 2006. Retrieved 2007-05-23. 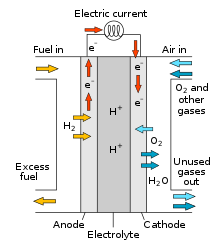 ^ a b "Fuel Cell Basics: Benefits". Fuel Cells 2000. Archived from the original on 28 September 2007. Retrieved 2007-05-27. 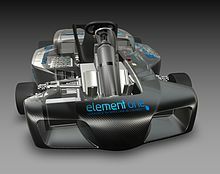 ^ "Global Hydrogen Fuel Cell Vehicle Sales Seeing Progress - HybridCars.com". HybridCars.com. 2018-02-09. Retrieved 2018-03-26. 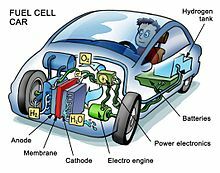 ^ "Fuel Cell Electric Vehicles". Community Environmental Council. Retrieved 2018-03-26. ^ a b Lathia, Rutvik Vasudev; Dobariya, Kevin S.; Patel, Ankit (January 10, 2017). "Hydrogen Fuel Cells for Road Vehicles". Journal of Cleaner Production. 141: 462. doi:10.1016/j.jclepro.2016.09.150. ^ Korzeniewski, Jeremy (27 September 2012). "Hyundai ix35 lays claim to world's first production fuel cell vehicle title". autoblog.com. Retrieved 2012-10-07. ^ "Hydro Dip: 2017 Honda Clarity Fuel-Cell Leases Cheaper Than Initially Expected". Retrieved 2018-03-26. ^ "From TechnologyReview.com "Hell and Hydrogen", March 2007". Technologyreview.com. Retrieved 2011-01-31. ^ White, Charlie (2008-07-31). "Hydrogen fuel cell vehicles are a fraud". DVICE. Archived from the original on 2014-06-19. Retrieved 2015-09-21. ^ "European Fuel Cell Bus Project Extended by One Year". DaimlerChrysler. Archived from the original on 29 September 2007. Retrieved 2007-03-31. 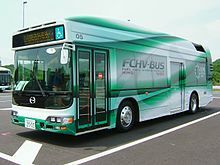 ^ "Fuel cell buses". Transport for London. Archived from the original on 13 May 2007. Retrieved 2007-04-01. ^ "Ônibus brasileiro movido a hidrogênio começa a rodar em São Paulo" (in Portuguese). Inovação Tecnológica. 8 April 2009. Retrieved 2009-05-03. ^ "Honda Develops Fuel Cell Scooter Equipped with Honda FC Stack". Honda Motor Co. 24 August 2004. Archived from the original on 2 April 2007. Retrieved 2007-05-27. ^ 15. Dezember 2007. "Hydrogen Fuel Cell electric bike". Youtube.com. Retrieved 2009-09-21. ^ CNBC.com, Anmar Frangoul | Special to (2016-02-02). "Hydrogen fuel cells… on a plane?". CNBC. Retrieved 2018-02-06. ^ Coxworth, Ben (2016-02-08). "Drone flight powered by lightweight hydrogen-producing pellets". www.gizmag.com. Retrieved 2016-02-09. ^ Martin, Christopher (March 10, 2014). "Plug, FuelCell Climb as 'Experiments' Seen as Profitable". Bloomberg.com. Retrieved December 28, 2015. ^ Johnson, R. Colin (22 January 2007). "Gold is key to ending platinum dissolution in fuel cells". EETimes.com. Retrieved 2007-05-27. ^ "Chemical Could Revolutionize Polymer Fuel Cells" (PDF). Georgia Institute of Technology. 24 August 2005. Retrieved 2014-11-21.